Thought I'd introduce myself and show you all the Murena I have just bought. It's been stored in a garage for the past ten years, so very dirty and in need of some restoration. Its first 250 miles were on the back of a car transporter yesterday. First job will be to was it down and start drawing a list of parts and work. Think there will be a lot that needs doing, but not much to get it running. Where do you start on a car that has not run for so long? I'm going to flush the engine, change the oil, plugs, filters, replace the engine hoses, new ignition, HT leads, distributor...then it might run. More to come when I can insert them. Hi Tim. Congratulations with your Murena. It looks to be in pretty good condition. You should have lots of enjoyment out of it. It will be seriously fun to drive. Is it a 1.6, 2.2, or 2.2S ? Ah, forgot the important stuff. 2.2. Im the 12th owner and it's got 225km on it, none for ten years though. Enjoy the car before a deep restoration project. When I bought mine I started it immediately but now it seems to be a never ending story... but today the car was transported to the painter so the process is going on. Congratulations buying a nice project-car like this. It can give loads of fun. Make it a nice car and keep us posted. Well, end of day 1 and I ripped out the 1980's alarm system and got it ready for work. Pics to follow. Thanks for the welcome. I've just sent my membership in and am hoping to come to your October gathering at Sudelely Castle to meet people and hopefully see some Murenas. I need to have a look at ones that run! Have spent a few days trying to start mine up but it is proving stubborn. So I will just commence with stripping down the obvious stuff and replacing bits that after 10 years, have probably rusted, blocked or just won't work. Filters, plugs, ignition, fuel pump and thermostat all to be looked at and changed. I need to start the engine to check there is not serious damage after ts long storage. Will you be coming along with your Murena, Pete? I certainly will, it's a 1.6 though. No problem with a 1.6' I'll be glad to poke over one that runs and to look at a few things that I think are non standard on my car. Air filter, exhaust, carburetter and who knows what else are all non original and need changing. First I need tomtry and start the engine. Cleaning the carb first but I also think a new fuel filter will help. Are they a standard size? I'm not really an authority on the 2.2, but those all sound like things that have been changed because the originals are hard to obtain. In your situation, my approach would be to get it running and see how it goes, it may take some time to get the correct parts if you're hell-bent on originality. The non-starting may just be stale petrol if it hasn't run for ten years. If your fuel filter is the in-line type, then any generic type will suit, it may have been added as an after-market item anyway. If Roy Gillard our technical advisor, and who knows more about Murenas than anyone else in the known universe, is at the October meeting then he will be able to advise you. SUCCESS! Got it running today for the first time in ten years. Found that there was no fuel getting to the carb, as the fuel hoses were so old, all the pump was doing was drawing air in. New hoses and fuel filter on and it started first time. Video to follow. Sounds a bit rattly. Timing chain perhaps? Or just a loose fastener down the side of the engine maybe. Now I can run it up on ramps and get underneath to check for gasket leaks. Even got the headlamps working, although there must be a slow leak in the vacuum system, as after half an hour, they will not rise. So will be changing all the vacuum hoses. Congratulations! When you get it on the ramps, have a good look at the trailing arms, these are the achilles heel of these cars, being the only part that wasn't galvanised. On a car that hasn't run for ten years the next thing I'd have a good look at would be the brakes. 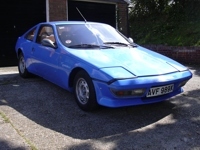 All the seals etc are obtainable but first study the brake booklet from here http://www.matraclub.org.uk/faq3.html#top. Why was the car taken off the road?